Detectives arrested a 12-year-old girl and her 10-year-old sister for allegedly abducting their neighbor's 1-year-old son and demanding $200,000 for his return. Brandon Wells was safe back at home Thursday night, hours after intruders broke into his family's residence and took him while his mother slept, police said. The siblings, who were not identified because of their ages, are accused of sneaking into Sheila Wells' home at about 5:30 a.m., taking her son Brandon and leaving a ransom note. "If you want to see your son again then you won't call police and report him missing and you will leave $200,000 on the sofa tonight and we will return your son back safe," the note read, according to police. The note was signed, "the kidnappers." The plan began to unravel when the girls' mother saw them with the child, police said. They told their mother they had found the boy on the corner, police said. As girls' mother tried to find Sheila Wells' telephone number, the 12-year-old returned to Wells' residence and told her it was the younger sister who was responsible for the abduction, police Capt. Dean Grassino said. 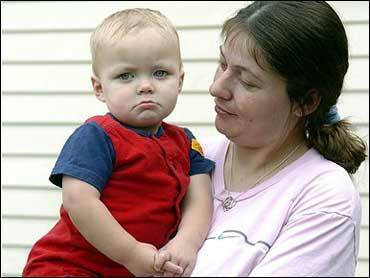 Wells immediately retrieved her child from the girls' home and police were called, Grassino said. Wells said she knew the girls and had banned the 10-year-old girl from her home a few weeks ago, but did not say why. The girls appeared in Garfield County District Court on Thursday afternoon and were taken to Community Intervention Center for juveniles. They have not been formally charged. "I know they're so young, but they need to learn from their mistakes," Wells said.